View from the Orange Grove | Where's my backpack? What comes to mind when you think of Rome? Spectacular art, ancient ruins, palaces and fountains top the list, but for me, my abiding memory of Rome will be of oranges. My friend Karen invited me to stay with her in her apartment overlooking the Campo di’ Fiori, which translated means ‘Field of Flowers’. It is an ancient marketplace right in the heart of the Centro Storico, the historical centre of Rome and early in the morning it really does look like a field of flowers when vendors set up their stalls filled to bursting with fresh blooms and the best vegetables in the city. After a sleepless night, a 2am bus ride and an early morning flight, I landed at Ciampino airport and took a series of crowded buses into the centre of Rome. I should have been exhausted, but as Karen led me up the stairs to her apartment and out onto her balcony, any trace of tiredness was swept away by the glorious view that spread out before me. Her balcony was the perfect homage to all things Mediterranean; fringes of rosemary and lavender with beautifully sculpted lemon, olive and orange trees in terracotta pots. 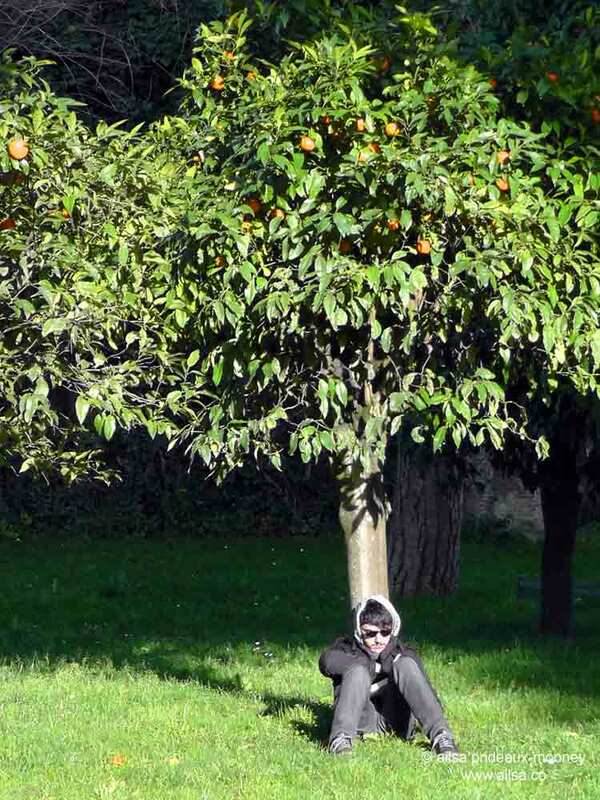 My first view of Rome was through the branches of an orange tree and it is a memory that will live with me forever. But the orange association doesn’t end there. 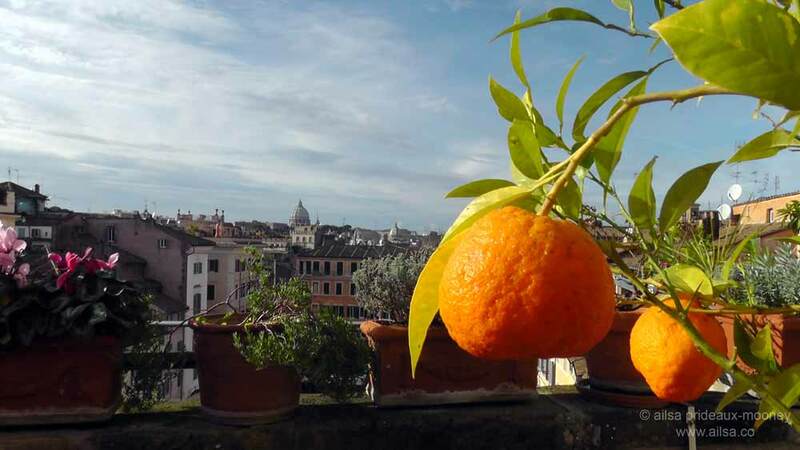 One of the loveliest views over the city can be found in an unimposing little orange garden high up on the Aventine. As I was making my way from the Mouth of Truth to the secret keyhole at the Villa del Priorato dei Cavalieri di Malta, I found this unexpected gem of a garden skulking quietly behind ancient walls. I wouldn’t have even known it was there if it weren’t for a few fallen oranges that told tales of what lay hidden behind the walls. Around the corner a graceful archway afforded a glimpse of the gardens beyond. …and a slender walkway wove through the grove, leading to a terrace with a panoramic view of the Eternal City. 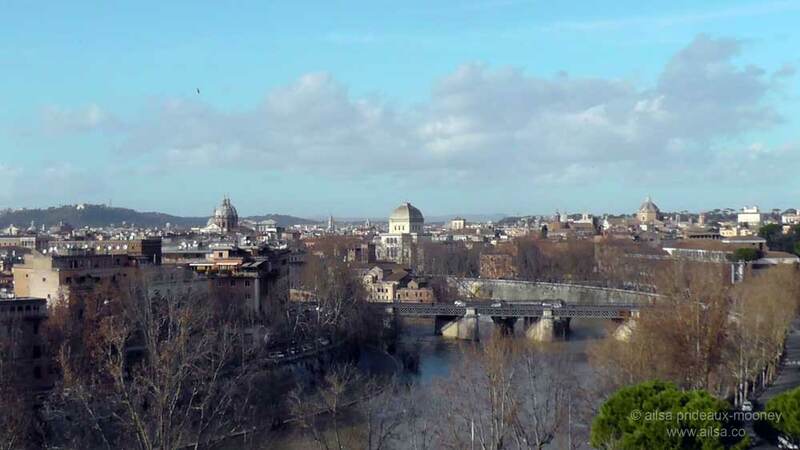 In one direction, the age-old palazzi of Trastevere dotted the skyline; on the other side the meandering curve of the Tiber led my eye over the rooftops and domes to St Peter’s Basilica and Vatican City off in the distance. According to legend, a bitter orange tree was planted in the cloister of neighbouring Basilica di Santa Sabina by the Spanish saint, Father Dominic, who brought the plant from his homeland in 1200 AD. Bitter orange trees are held to be the world’s first cultivated oranges, brought to Europe via the Middle East. The sweet oranges we enjoy today didn’t reach Europe until around the 15th century, probably brought here by Portuguese traders from the Far East. While St. Dominic’s original tree has long since expired, a sapling from the original tree took root and grows there to this day. The park itself used to be monastery gardens belonging to the Dominican Order and more bitter orange trees were added at a later point to compliment the original tree planted by St. Dominic. Officially named Parco Savelli; this park has come to be known for its orange trees and is often referred to as Il Giardino degli Aranci (Garden of Oranges). In summer the gardens are host to a variety of outdoor theatre productions and a popular picnic spot, but in the off-season it is a tranquil escape from the hustle and bustle of big city life. It is the perfect spot to go for a wander, take in the view and maybe read a book underneath one of those glorious orange trees. 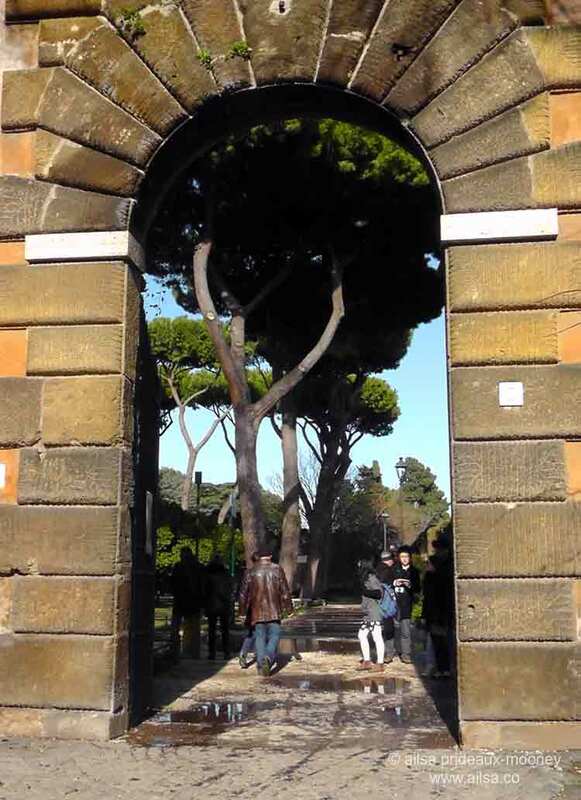 If you fancy a wander through the orange grove next time you’re in Rome, you can find it on the Via di Santa Sabina on the top of the Aventine Hill. It is open from 7am until sunset. This entry was posted in Europe, Italy, Photography, Travel and tagged gardens, history, inspiration, nature, photography, travel, writing. Bookmark the permalink. Were hoping to head to Rome this summer and the thought of roaming amongst orange trees had never crossed my mind. Now that’s all I want to do! I’m pinning this post so I can find this park. I haven’t been to Italy, but hope to visit someday! What a great trip you had! I loved Rome, but for me the River will be my abiding memory…..along with amazing ice-cream! Oh yes….such delicious ice cream! I couldn’t get enough of the Cassata gelato, I’ve never tasted anything like it before! We took a family vacation here in 2012…trip of a lifetime. I miss it so!! Thank you for your post! I too love Rome! Lovely share. Thanks! We planted a lemon tree in our courtyard a few years ago. Love being able to go out and pick fresh lemons. Oh how wonderful. I’ve always wanted to grow Meyers lemons; they’re just about the most amazing lemons I’ve ever tasted. One day, when I have my own garden and greenhouse! As a lover of Rome, you must see La Grande Bellezza (The Great Beauty) if you have not. A total love affair with Rome and a brilliant movie. Rome and oranges would not have been a combination that sprung to mind. I love the first image of the orange best. It’s totally a dream to wander with you in these less frequented places, Ailsa. 🙂 Maybe I would like bitter oranges. I don’t much like the sweet variety but the trees and their blossom are beautiful. I’m sure future visitors to Rome will be inspired by your beautiful writing to visit this garden. Those small places away from the main attractions are often the most enjoyable as they lead to experiences of the real lives of people. What a wonderful view your friend has from her balcony with the orange tree! 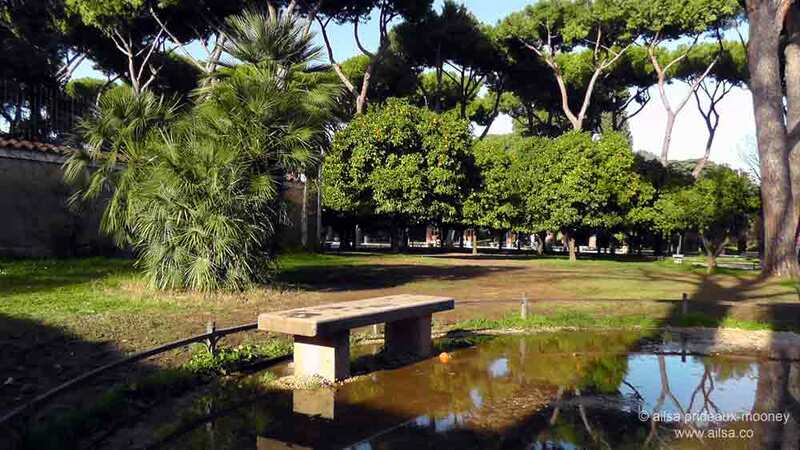 And Il Giardino degli Aranci sounds lovely… Must get to Rome one day! So beautiful. Does the grove have the scent of oranges? Always wondered about this. What a wonderful vignette of Rome. I’m putting this garden on my list for next time too! I’d like to go to Rome and see a lot more of Italy than I have!